SMS Impossible Mission (Europe, Brazil) in 07:44.26 by Isotarge & The8bitbeast. 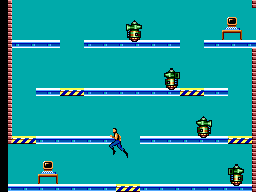 Impossible Mission was released in 1984 for the Commodore 64 and later ported to a various array of systems, including the Sega Master System in 1988. In the game, the player is a secret agent on a quest to stop the evil Professor Elvin Atombender - but first they must find 36 puzzle pieces and combine them to unlock the control room where the Professor is hiding. Many gameplay elements are randomized, such as puzzle piece location, building layout, and robot movement, in an effort to make each playthrough unique. In this run, the authors front-flip through obstacles and manipulate the game's randomization in order to reach the Professor in less than 8 minutes.